Whether you're on the your way to work or working out, it's likely you'll be using earbuds to tune out the hustle and bustle around you. And if you've ever been irritated by headphones with iffy sound quality and an even worse fit, Nikki Kaufman and the team at Normal aim to have you covered. Normal, which officially begins taking pre-orders today, is a startup that makes 3-D-printed personalized headphones. It is the latest venture from Kaufman, who knows a thing or two about innovation from her work as a member of the founding team at Quirky, a company that teams up with inventors to develop, manufacture and distribute product ideas. The 3-D headphones were designed to simplify the process of getting high-quality custom headphones. That process often involves a trip to an audiologist, a silicon cast of your ears and an end product that can cost thousands of dollars. "At the end of the day we want everyone to have a premium product…your ears aren't weird, they're normal, and that's why we're doing this." Users can customize color and style to their own specifications. Normal headphones are made in New York and ship within 48 hours. 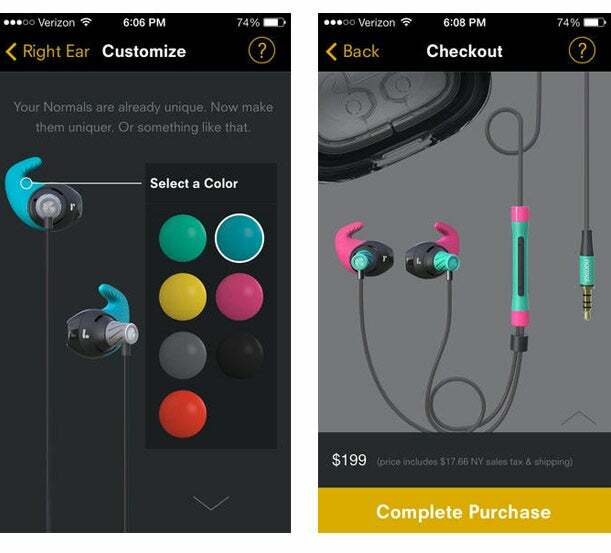 The headphones can only be purchased via Normal's mobile app, which takes photos of your right and left ear to get the best fit, and then walks customers through the customization process, from color to cable size. The app, which is now available in the Android and Apple store also alerts customers to each stage of production. "Everyone is talking about mass customization, 3-D printing, the reinvention of retail stores, and what that all looks like and we're really proud to be one of the first examples of that," says Kaufman. The earphones also come with a remote, microphone and a customized and engraved carrying case. The Normal team promises a shipping time of 48 hours, priced at $199. "If you want to run with them, sweat with them, you can." Kaufman says that because the fit is so specified, it creates a seal over the ear, so users don't have to turn the volume way up to hear their playlists. Normal's full-service New York City headquarters also doubles as its factory and retail shop. The company, whose tag line is "one size fits none," will begin shipping orders August 9, the day the storefront is also open to public.